Contact Details: Capuchin Friary, Ard Mhuire, Creeslough, Letterkenny, Co Donegal. Guardian: Rev Richard Hendrick, OFM Cap. Vicar: Rev Eddie Dowley, OFM Cap. Masses: Sundays & Holydays of Obligation: 9am, 5.30pm. Confessions: Monday – Saturday 11am-1pm, 2.30pm-5.30pm. Community Members: Rev Pat Lynch, OFM Cap., Rev Tom Forde, OFM Cap., Br. Vianney Holmes, OFM Cap. 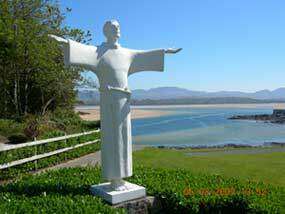 Contact Details: Franciscan Friary, Rossnowlagh, Co Donegal. Tel. 071 985 1342 Fax 071-9852206. St Anthony Novena: Tuesday 7.30pm. Secular Franciscans: Second Sunday of Month at 3pm. Exposition of the Blessed Sacrament: Sunday 3pm – 6pm. Sr Monica McCormilla, Sr Gerard McLaughlin, Sr Concepta Murphy, Sr Valerie McGeough, Sr Brigid McGowan, St Perpetua O’Donnell, Sr Mercedes O’Donnell, Sr Bernard McGill, Sr Margaret Mary McGread, Sr Martina Hamilton, Sr Sheila Curran, Sr Imelda Burke. 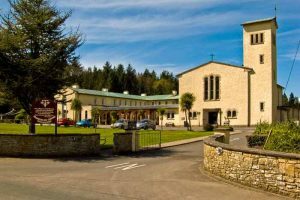 Mercy Convent, Glenties, Co Donegal. Founded in Belgium in 1938 by Julia Verhaeghe. Approved by the Holy Father, John Paul II, as a Family of consecrated life of pontifical right on 29 August, 2001. The Sisters of the Merciful Jesus have taken up residence in what was once the Loreto Convent in Letterkenny.